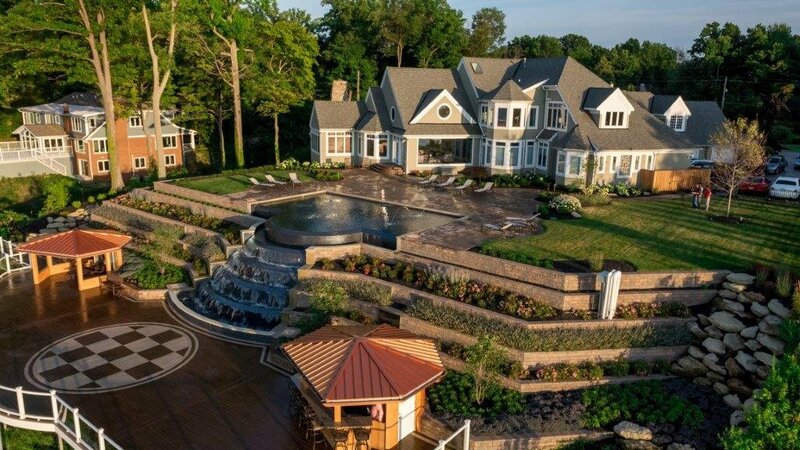 Most people think of our winter Northern Ohio landscapes as a cutback dormant time, but there are many options for interest. There are perennials that are evergreen, have beautiful dormant seed pods, attractive leaves, and color. Do your research, the possibilities are unlimited. Our first stop is evergreen perennials. The fern for winter color comes as surprise to many but there are several that are evergreen and do well in Ohio. The Christmas fern is a perfect pick. This plant grows to 24” and has thick green fronds. This fern also does well in full sun if it is kept moist. Other evergreen ferns that stand out include Autumn Fern and Male Ferns. 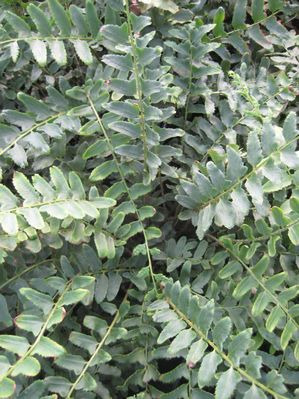 The Autumn Fern grows 2-3’ tall and wide. This variety can handle deep shade and morning sun. The Male Fern is a 24” upright evergreen that shows deep green fronds. Ferns are a great plant for a herbaceous boarder. Ferns are easy to grow and prefer a woodland area, rich-humus, slightly acid soil. Moisture is the biggest key for survival. 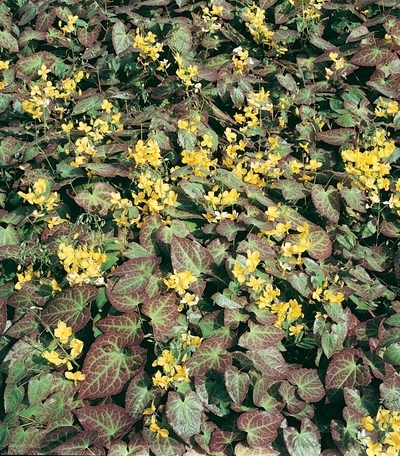 Barrenwort is a superior ground cover unusual foliage and tiny flowers for use in shady and woodland areas. In Ohio, this plant usually keeps its fall colorful leaves throughout the winter. The spring flowers last 4-6 weeks and has a height from 8-12”. Another special ground cover that is evergreen is wild European Ginger. This 3-4” ground cover has a rich, kidney- shaped, dark green glossy leaf. This plant struggles in the sun but thrives in the shade in rich soil. This hardy plant is not widely used but is a gem. The Wild Ginger can easily be split and transplanted. The Helleborus has large leathery leaves that are evergreen. The flowers start showing in February and March and lasts up to eight weeks. These flowers vary from white, green, pink, yellow, purple and to deep rose. These plants seed readily and can fill in a large area in your garden in a few years. Iris is another plant that can catch you eye in winter. 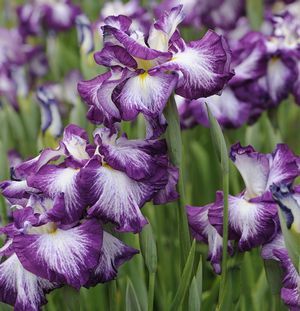 Irises are steeped in history and lore. The Iris flower has been a symbol of French culture since the reign of King Louis XIV. The Iris, in Greece, referred both to rainbows and the goddess who used the rainbow as a bridge to carry messages from Zeus to the mortal world. Iris colors come in shades of pink, red, purple, blue, white, brown and yellow. This plant blooms in the spring, summer and sometimes fall depending on the variety. The flat and sometimes colorful foliage will last through the winter and looks great slicing through the snow. The Grapeleaf Anemone are 3’ tall with single pale pink to white flowers in late summer into early fall. This plant is adaptable to sun or shade. The foliage resembles grape leaves. The white wooly fruit remain throughout the winter. Always a hit in the winter are perennial grasses. The Sea Oats is a showy, drooping flower/seed head and bamboo-like foliage. The stems reach 2-3’ in height with green foliage in summer to coppery brown in the fall and persisting into winter. Planting these in mass add “ sound” to the garden. 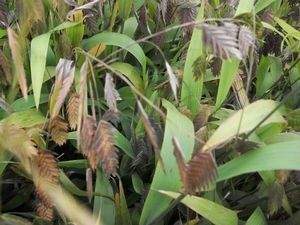 Most other grasses have an ornamental foliage effect into late fall and early winter with beautiful brownish colors. Cut down the grasses still standing in late winter to get nice growth in the spring. Wrap the grass in two spots with duck tape to keep the reeds from falling and making a mess.